Turnovers are defined as small squares or circles of pastry dough that are filled with a sweet or savory filling, folded in half and pinched to seal, and then either baked or deep fried before serving. I guess I’m a bit narrow-minded when it comes to these pastries because, despite how broad the definition is, I can’t help but think of them as fruit-filled, single serving dessert pies. Fortunately, I like sweet turnovers very well and am perfectly content to continue to think of them this way, rather than wondering if I should start calling my empanadas “turnovers”. Apple turnovers seem to be the most common variety of this pastry, largely because apple pies are so very popular. I opted not to use apples in mine, however, and to use some fresh and fragrant nectarines that I picked up at the store this week. Nectarines, as a stone fruit, are usually quite firm. This means that they can – and should – be prepared in much the same way as apples (or another firm fruit) would be for this recipe. For the filling, the fruit is peeled and chopped into small, even cubes, then is cooked in a sugar syrup until the filling is thick and the fruit is tender. This thickening process is something that would normally take place inside the oven if you were cooking a whole pie, but the baking time for turnovers is much shorter and there simply isn’t enough time to ensure that your filling will get tender enough (without making the pastry soggy) during a short stay in the oven. You don’t want the filling to be too liquidy and risk that it will ooze out of the pastry cases during baking, so if your filling doesn’t thicken up enough on its own (this partially depends on the juciness of your nectarines), I’ve included a note about adding a bit of cornstarch to the fruit during cooking. Any puff pastry will work fine for this recipe. I used a store-bought (“artisan”) puff pastry. When you go to work with it, make sure it has defrosted completely in the refrigerator and be sure to roll it out lightly before working with it. Don’t worry about rolling your pastry out to a specific size; work with whatever size or shape your pastry comes in. Turnovers should be quick, easy and casual desserts, so treat them as such. You can prepare the filling in advance and chill in the refrigerator overnight. You can also fill and freeze the turnovers. If you opt to freeze them, freeze in a single-layer before storing in a freezer bag, and expect to add some additional time to the baking time. Peel nectarines and cut into 1/4-in cubes. You should have about 2 1/2 cups of nectarines. Place in a medium saucepan with sugar, lemon juice, vanilla, butter, salt and nutmeg. Cook over medium heat until mixture bubbles and nectarines are tender. Stir in 1 tbsp water mixed with 1 tsp cornstarch and continue to cook until thick. Total cooking time, start to finish, should be about 10 minutes. Remove from heat and cool completely. Filling can be prepared ahead of time and chilled. Roll out thawed puff pastry on a very lightly floured surface until pastry is a large square. Use a pizza cutter to slice into quarters. Spoon 1-2 tbsp of filling into each square and fold diagonally, keeping filling away from the edges. Use a fork to crimp edges and seal. Place on baking sheet and repeat with remaining pastry. Stir egg with 1 tbsp water in a small bowl. When all turnovers have been made, brush with egg wash and sprinkle generously with coarse sugar. Bake for about 20 minutes, until dark golden brown. Note: If baking from frozen, bake for 10-15 minutes at 400F, then reduce the oven temperature to 350F and continue to bake until pastries are dark golden brown. These look great for some nice, ripe nectarines. Were you able to find some right now?? 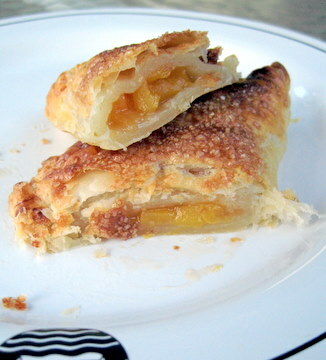 I have seen many turnovers around, but never with nectarine – they look scrumptious, Nic!